The son of a Paris butcher who won 11 national motorcycle titles in three years before making the switch to four wheels in a 1.1-liter Rene Bonnet sports car in 1963. His career almost finished prematurely with a huge shunt in the Reims 12-hour sports car race which left him with a badly broken left arm - and restricted movement in that damaged limb thereafter. Beltoise put the Matra marque firmly on the racing map with a great win in the 1965 Reims Formula 3 international after which he graduated into Formula 2 for the following season. Beltoise won the Formula 2 section of the 1966 German Grand Prix and then rounded off his Formula 3 career by winning all four races in the Argentine Temporada series over the following winter. He had another good year in Formula 2 in 1967 and then graduated to Formula 1 driving the V12-engined Matra, taking a splendid second place in the rain-soaked 1968 Dutch Grand Prix. For 1969 he was recruited into Ken Tyrrell's Matra International team to drive alongside Jackie Stewart in the Matra-Fords, finishing second to the Scot in the French Grand Prix at Clermont-Ferrand. In 1970 he returned to the works Matra team where he stayed - with much promise, but little success - until the end of the following year. He competed successfully with the Matra sportscar team but was involved in the accident which killed Ignazio Giunti in Buenos Aires in 1971 and had his international racing license suspended for some time.In 1972 joined the Marlboro BRM team and won what turned out to be the British marque's final Grand Prix win at Monaco in torrential rain. He raced on with BRM through to the end of the 1974 season before retiring from Formula 1. He did most of the testing for the Ligier F1 team but when Jacques Laffite got the drive Beltoise turned his attention to touring car racing in France and won the French title twice for BMW before trying the rallycross scene in an Alpine-Renault with which he won the French title. In 1981 he went back to touring cars and raced for Peugeot throughout the 1980s. He is also a regular ice racer. 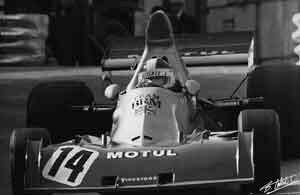 He is married to Francois Cevert's sister Jacqueline and they have two sons who are both racing drivers. Beltoise runs a kart track in Paris and is involved with a variety of other racing activities.